According to the classical doctrine of Chinese medicine, there is an endless flow of life energy (qi) throughout the human body. This vital energy originates from the major organs, and flows along the continuous circulatory channels called meridians. When the energy flow is smooth and in balance, a person is healthy. If the balance is disturbed, then a person will feel ill or pain. There are specific points along the meridians, which your acupuncturist will stimulate with fine needles to regulate your energy flow and bring health to the whole body. After an initial assessment (see Traditional Chinese Medicine Consultation), Dr. Natasha Grbich will begin treatment where only disposable needles are used. The needles are as thin as human hair and rarely cause pain upon insertion. The number of needles used depends upon the condition. Typically, the needles are left in for twenty minutes while you rest and rejuvenate in the peaceful environment of your treatment room. Most patients go into a deep state of relaxation and some even fall asleep due to the endorphins released during treatment. 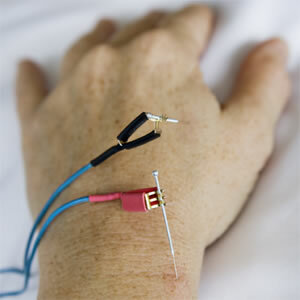 In areas where the muscles are especially tight, electrodes may be attached to the needles. This electrical current provides a steady vibration to the hypertonic muscles, which feels like a gentle pulsing. This technique is also described as Percutaneous Electrical Nerve Stimulation (PENS). It was first developed in China in the 1950’s used in conjunction with surgeries for anesthetic properties and to reduce the use of pharmaceutical anesthesia. Acupuncture and Electro-Acupuncture treatments are used for chronic pain, obesity, physical rehabilitation, substance abuse, depression, insomnia, anesthesia, facial rejuvenation and more. A non-invasive method to diminish wrinkles and restore one’s natural radiance.